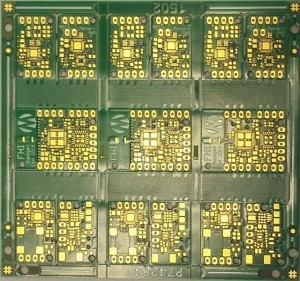 SEMI-FLEX is a flex to install PCB, typically 4 layers, made entirely of FR4. Unlike conventional flex-rigid PCBs, the flexing element is not polyamide but a thin FR4 core with two layers of copper specially treated to flex without cracking. A less robust solution uses a depth-milled layer rather than a core. SEMI-FLEX is flex to install. Unlike polyamide, the FR4 core is not capable of continuous flexing. 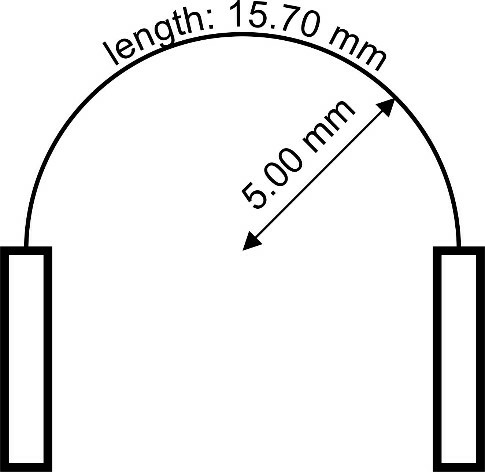 However it will bend a limited number of times (typically 5 – see the technical specification below) at a controlled radius and to any angle. 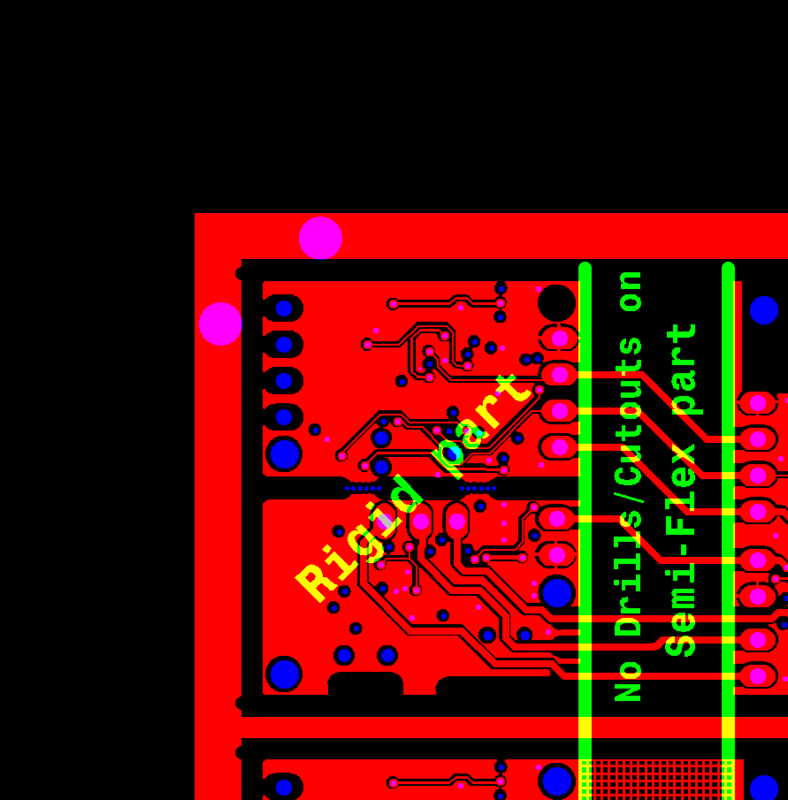 This makes it an ideal solution where you need to mount two PCBs in a unit at an angle to each other. Instead of using connectors and cables or a composite flex-rigid PCB, you can design a single FR4 SEMI-FLEX PCB which can be safely bent a sufficient number of times to allow installation and subsequent maintenance as needed. Eurocircuits’ 4-layer SEMI-FLEX PCBs use a 100 micron central core for the flex area, with 35 micron high-ductility copper foil on each side. The stack is then made up on each side with a 510 micron FR4 core and two layers of no-flow pre-preg (see the full technical specification below). An alternative technology is to build a 2- or 4-layer PCB and then depth-mill the material away to leave a thin section as the flex area. We have adopted the core solution even though it needs more operations and so is a little more expensive. It gives a symmetrical build and so a more stable board, while depth-milling is difficult to control meaning that the flex area may have an irregular thickness. With a core-build we through-mill (rout) the pre-preg before pressing. We can then rout the outer layers with any minor variation in cutter depth being absorbed by the void. 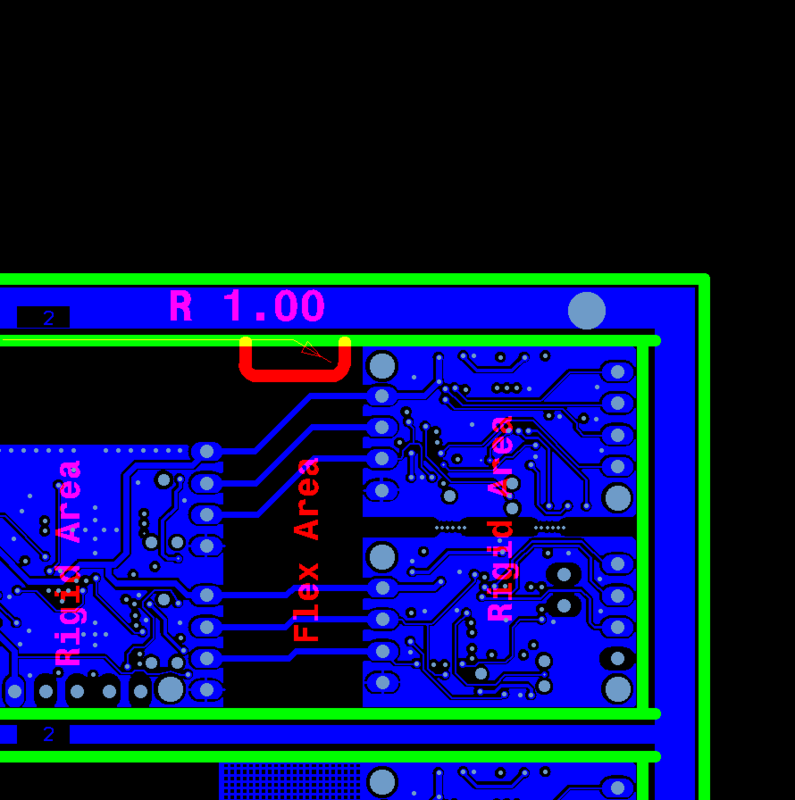 The core build makes it easier to design a main board with up and down sections or a final Z-configuration. SEMI-FLEX boards are preferably supplied in a panel to avoid any damage during transport or assembly. Click here to get prices. Peel-off mask, PTH on board edge, round edge plating, copper up to board edge. Plus carbon pads and edge connector gold as non-pooling options.